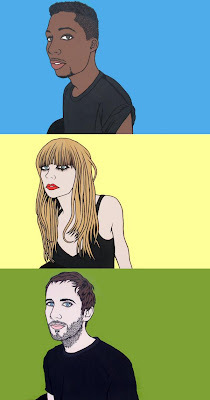 We Have Band are an indie rock/pop trio from London, England. Tom wrote about them back in February. You can check out that post here. Their new video for 'You Came Out' really caught my attention the other day. Great stuff! Stop animation with water colors. Ha.. Apparently it took almost 5 thousand still shots to get it right. It was worth it cause it came out great! The songs not too shabby either. Here is that video/track plus a great cover they did for Pet Shop Boys classic 'West End Girls' that I had lying around waiting for a perfect opportunity to post. Plus a remix by Gentlemen Driver's of previous single Oh! that is also quite good. not too shabby???? the song is awesome! best vid of the year!